While Windows 7 comes with native support for mount VHD files there is one downside , all VHDs are unmount it every the system goes through a reboot. The shortcoming can be remedied with the help of a free third party tool called VHD Attach created by Josip Medved. This is a two step tutorial. First we’ll have to specify the VHD we need to be auto mounted , second the VHD will be mounted with a drive letter. Note: This post assumes you already installed the application. Start the application and click on the highlighted icon found at the top of the right corner. Browse to the directory where the VHD you wish to mount is located and double click on the VHD to selected. Now that you are back in the main menu click on the Open icon. Once again browse to the location where VHD is found and double click on it. VHD Attach will display relevant information about the VHD. Click on the Attach button found at the top. After this step the VHD becomes accessible from My Computer. If you click on the Tools button you can see that the VHD will be mounted on every start up, you can even change the drive letter if you like. You can close the window if you like, from now on the VHD will be automatically mounted every time Windows starts. And here is the VHD displayed as a local drive. Comments and questions are always welcomed. If you didn’t read “The Microsoft Partner SMB Community Blog” then you might have missed the announcement that small business as soon as early October 2010 will be able to legally install and use Microsoft Security Essentials on up to 10 (commercial) PCs at no cost. In case you didn’t know the current EULA included with Microsoft Security Essentials does not allow for commercial use, Microsoft will adjust the EULA to reflect the announcement. 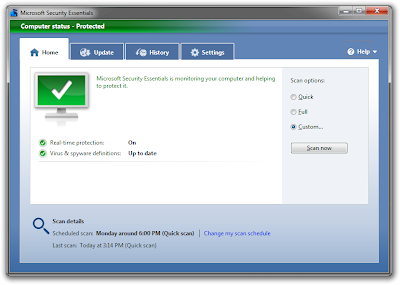 Microsoft Security Essentials lacks centralized administration, If you need to secure more than 10 PCs you need to use Forefront. 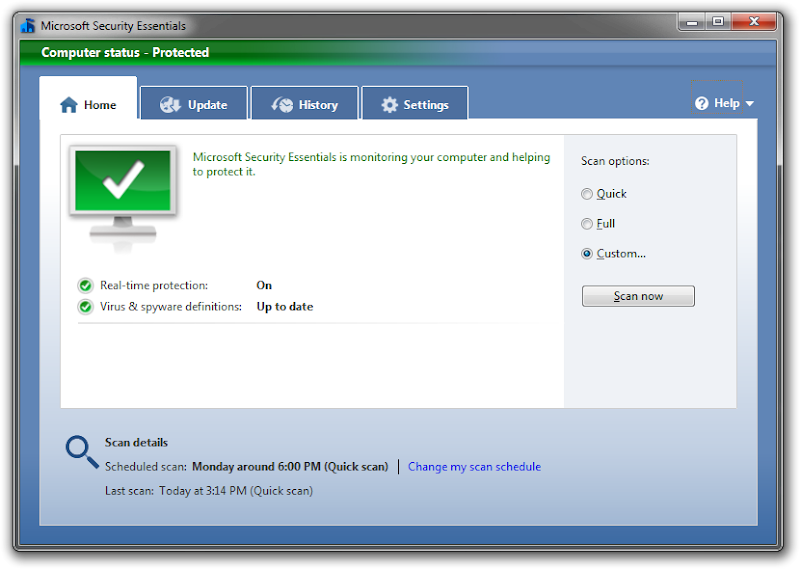 For a free product Microsoft Security Essentials does an excellent job as an AV product that gets out of the users way and consumes little resources. With this in mind, Small Business usually do not employ on site staff and due to the low amount of users centralized administration may be an overkill. Also, it would not be far-off to consider Microsoft Security Essentials a stepping stone in to Microsoft business oriented AV solution Forefront for those businesses that want more control. If you need to have a drive checked (Check Disk) on Windows but instead you are having a though time doing so because of open file handles, then you might want to use Fsutil. Thanks to Fsutil you can query the drive in question and mark the drive as dirty and have autochk check for error on the next restart. Performs tasks that are related to file allocation table (FAT) and NTFS file systems, such as managing reparse points, managing sparse files, or dismounting a volume. If it is used without parameters, fsutil displays a list of supported subcommands. Will the drive be checked on start up? Fsutil will mark the disk as dirty, the next time you restart the system the disk in question will be checked and repaired. Rebuilding a working system from scratch can be time consuming, because of that its a good idea to use P2V or Physical to Virtual tools that automate the process for you. One of them is Disk2vhd by Sysinternals created to ease the transition process from baremetal to virtual with a few clicks. This P2V tool works by creating a virtual image of the system its running on and the result is a VHD file(Virtual Hard Disk – Microsoft’s Virtual Machine disk format) which can be use in Microsoft Virtual PC or Microsoft Hyper-V .
Disk2vhd is easy to understand and use. You can download Disk2vhd free of charge from the Sysinternals site. Note: Due to the hardware changes you may need to reactivate the operating system once again. The Microsoft Web Platform Installer 2.0 is a tool design help administrator install the latest components like Microsoft Web Platform, Internet Information Services (IIS), SQL Server Express, .NET Framework, PHP and Visual Web Developer just a few clicks away. Is not limited to just components you will also find the most popular free web applications for blogging (WordPress), content management(Drupal) and more with the built-in Windows Web Application Gallery. No longer will you have to hunt down separate components, instead spend more time configuring rather than installing. Being a higher education student has some benefits (aside from partying), one of them is that you get Microsoft software at reduced or no cost to you. In most cases all you need to prove eligibility is an email address ending with .edu. Meant to promote Microsoft software to students The Ultimate Steal offers cheap upgrades and complete versions of Microsoft products. Visit The Ultimate Steal. DreamSpark provides a wide variety of Micrososft software(server and design tools) to both high school and higher education students. Asides from having to be a student you will need a Windows Live ID. Visit DreamSpark. Is a Microsoft program available to academic organizations, mainly colleges and universities, although there is also a high school version. The participating schools pay an annual fee for the MSDNAA service, in exchange for which, applicable departments (computer science, computer engineering, information technology, and related fields of that organization) as well as students and faculty can acquire licensed copies of Microsoft software such as Microsoft Windows, Visual Studio and other products. Consult with your school to see if they participate in the program. Visit MSDNAA. For a limited time Microsoft is offering an upgrade to Windows 7 Home Premium or Professional for only $30 USD. The offer will only be valid till January 3, 2010. Visit Win741.com.